Another week down people, yay! After the hell of a week I just had, I couldn't be happier to have a couple of days off. Hope this Friday means the start of some awesome weekend plans, and if not then just a little rest and relaxation. Who doesn't love a little (or a lot) of that!? To kick-start your weekend here are some things I found this week and loved. I just couldn't help but share! Hope you enjoy and have a killer weekend! What Your Coffee Says About You // Anyone that knows me well can tell you how much I love my coffee. There is almost never a day I go without it, and having more than one cup is not unusual. So of course when I came across this article, I just had to see what it said. Although I do love a nice hot cup of coffee, I must say that iced coffee is typically my go to - yes, even during the frigid New England winter months. With that being said, according to my coffee order I am ‘The Trendsetter.’ I am not entirely sure how accurate that is, but I also don’t hate it. A latte is normally my alternative when I’m feeling like switching it up, and based on that I am ‘The Cool Classic.’ I like to think I fall somewhere in between. Of course this is all just for fun, but all my coffee lovers out there should most certainly check it out! 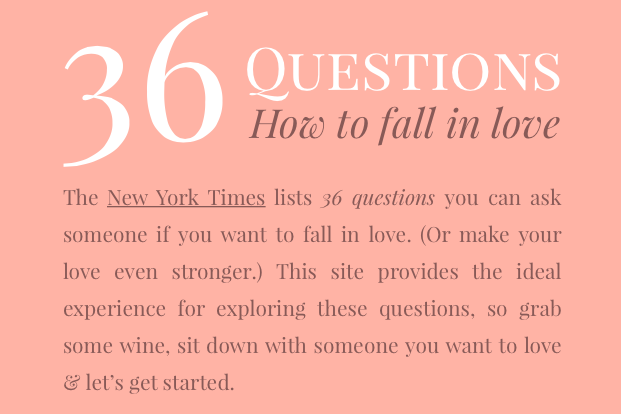 36 Questions to Fall in Love // According to the New York Times there are 36 questions that can make you fall in love with anyone. Whether or not this can actually make two people fall in love is up for debate, but the hopeless romantic in me loves the idea. Regardless of it's effectiveness, I do believe that answering these questions could bring people closer together- whether that be friends or lovers. I even found that going through these questions on my own really made me think about things, which is important to do from time to time. If no true love actually comes out of this, at least you can count on a great conversation and I’m sure a few good laughs. So what are you waiting for? As the instructions say, grab some wine, the person you love, and give it a go! What's Your Biggest Regret? // Needing a dose of inspiration? Watch this. The concept behind this is so simple, but wow did it have quite the impact. I think one of my biggest fears is going through life & one day waking up and realizing I didn't do the things I wanted to. Regret is a scary idea to me. Sometimes we think we have all the time in the world. The truth is we don't. I think it's important to not put out off doing the things you want to because you think you have time or you think you can do it later on. If you want to do it, do it now. I promise you that someday when you look back on your life, you will regret the things you did not do far more than you will the things that you did do. 13 Runners Give Beginners Advice // This article is something that I honestly feel everyone should read. It's funny because I never considered myself a runner, and because of that I still have a hard time acknowledging the fact that I am. However, three half marathons later I guess I most certainly am a runner. I honestly don't know how I ever went without it. The truth is you can be a runner & never run a race in your life. It's not about completing certain milestones, it's just about getting out there and doing it. Nothing drives me crazier than hearing people say "I'm not a runner." You are. You just have to do it.